The Desoutter Aircraft Company was formed by Marcel Desoutter in 1928, with facilities located at Croydon Airport in the UK undertook licensed production of the Dutch designed Koolhoven FK-41 under the Desoutter name. The FK-41 was one of the first successful cabin monoplane aircraft to be developed. Dutch born Frederick 'Frits' Koolhoven, designer of the FK-41, returned to the Netherlands from the UK in 1920 after the collapse of the British Aerial Transport Company where he had worked as their Chief Designer. After working for four years at the National Aircraft Company in the Netherlands, that company also failed and Koolhaven managed to convince the investors to invest in a new company as N.V. Koolhoven vliegtuigen (Koolhoven Aircraft, Inc.), to compete with the already successful Fokker company. The Koolhaven company built a number of one-off designs to order, until achieving success with the FK-41 high wing three seat cabin monoplane in 1928. This was also a design layout equally successful for Fokker in its larger trimotor airliners. Although NV Koolhaven only built six examples of the FK-41, the aircraft was built as the Desoutter under licence in the UK. Koolhaven went on to make military aircraft including trainers and observation aircraft for the Dutch Airforce and fighters for France. In May 1940 the Koolhaven factory was destroyed in the German Blitzkrieg, prior to the invasion of the Netherlands. The modern design of the FK-41 as a wooden high wing cabin monoplane attracted a lot of attention in Europe in 1928, where its contemporaries were typically two seat open cockpit biplanes, but with less comfort and speed. The Desoutter aircraft were marketed in 1929 as the Desoutter Dolphin but that name was quickly dropped to simply Desoutter. Painted a distinctive black and orange, and fitted with Cirrus Hermes engines, the first 28 aircraft became known as Desoutter Mark I aircraft, and in 1930 a revised version with redesigned ailerons and tail surfaces, improved brakes and Gipsy III engine was released as the Desoutter Mark II, with a further 13 being built, a total of 41. Despite its good performance and handling the Desoutter was eventually overtaken in sales by similar high wing cabin monoplanes developed by the de-Havilland Company who produced over 259 of its Puss Moth aircraft from 1930 to 1932, and 133 Leopard Moths from 1933 to 1936. A solitary Koolhoven FK-41 arrived in Australia in 1929, while the first of three Desoutter II aircraft to be registered in Australia arrived in 1930. The last arrived in 1932 and was Desoutter mark II VH-UEE, which was used to establish air services between Launceston and Flinders Island, before becoming part of the fledgling Holyman Airways, forerunners of Australian National Airways and Ansett-ANA. A fourth Desoutter II aircraft registered OY-DOD from Denmark, entered Australia as a competitor in the 1934 MacRobertson Centenary Air Race, flown by Lieutenant Michael Hansen, who placed 8th outright, and 7th position in the handicap race taking 129 hours and 47 minutes to cover the course from Mildenhall UK to Melbourne Australia. Arriving in Melbourne on the 1st of November 1934, its stay was brief, departing on the return flight to Europe on the 13th of November and the aircraft later joined the Finnish Air Force as DS-1. The Museum's aircraft with registration VH-UPR was the first Desoutter to be imported into Australia, and arrived in 1930. 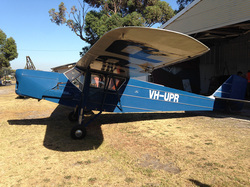 VH-UPR was imported by the local Desoutter agent Hart Aircraft Services and spent its early working life with them at Essendon Airport until 1937. During this time the museum’s Desoutter was used for charter work, pilot training and duties as an aerial taxi. In the third week of October 1934 it took part in the search for the A.N.A. DH86 airliner “Miss Hobart” VH-URN which disappeared over Bass Strait on October 19th. On October 23 it flew out to meet the winning DH Comet aircraft of Scott and Black, winners of the 1934 England to Australia Centenary Air Race, as they arrived over Melbourne. It subsequently passed through a total of seven other owners, operating with Victorian and Interstate Airway Pty Ltd from 1937 to 1943. It's role during the Second World War is unknown, however, a photo found recently shows the aircraft with RAAF colours on the fin and what appears to be a camouflage paint scheme. Post war the aircraft passed through private owners until it was grounded in 1957, eventually being found by AARG members in derelict condition at Parkes in N.S.W in the mid 1960's. 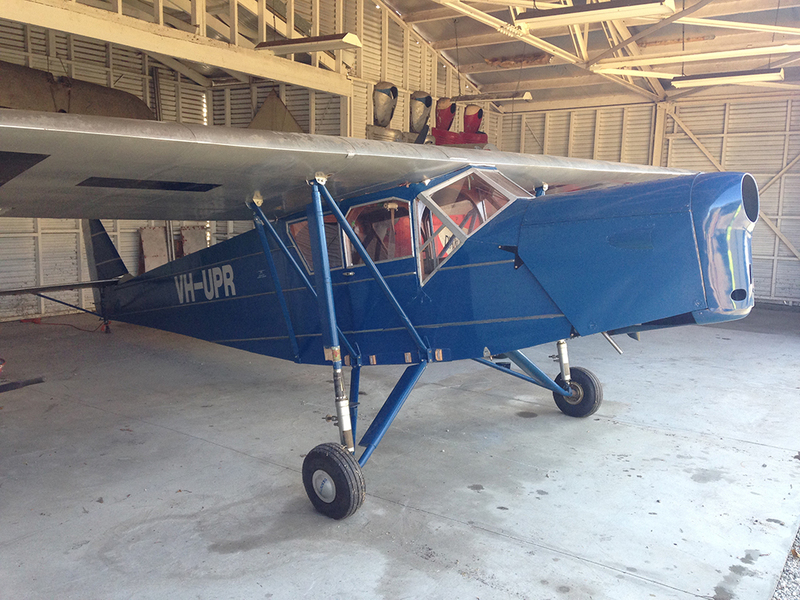 Donated to the museum in 1968 it was stored undercover for many years, then taken to Lilydale and underwent a meticulous restoration under the direction of Life Member Nelson Wilson which has seen the aircraft returned to its former glory, and flying condition. This Desoutter is one of three examples surviving world wide, and the only survivor flying in the southern hemisphere, with a Desoutter mark I surviving in flying condition in the UK with the renowned Shuttleworth Collection.